On Wednesday, the Federal Reserve Board released its January 2019 Beige Book update, a summary of commentary on current economic conditions by Federal Reserve District. The report included several observations pertaining to the U.S. agricultural economy. * Sixth District- Atlanta– “Agriculture conditions across the District were mixed. 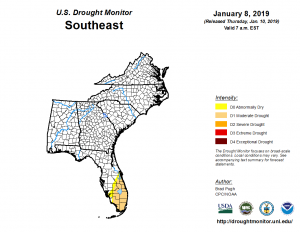 Recent reports showed most of the District was drought-free with the exception of parts of south Florida where there were abnormally dry to moderate drought conditions. 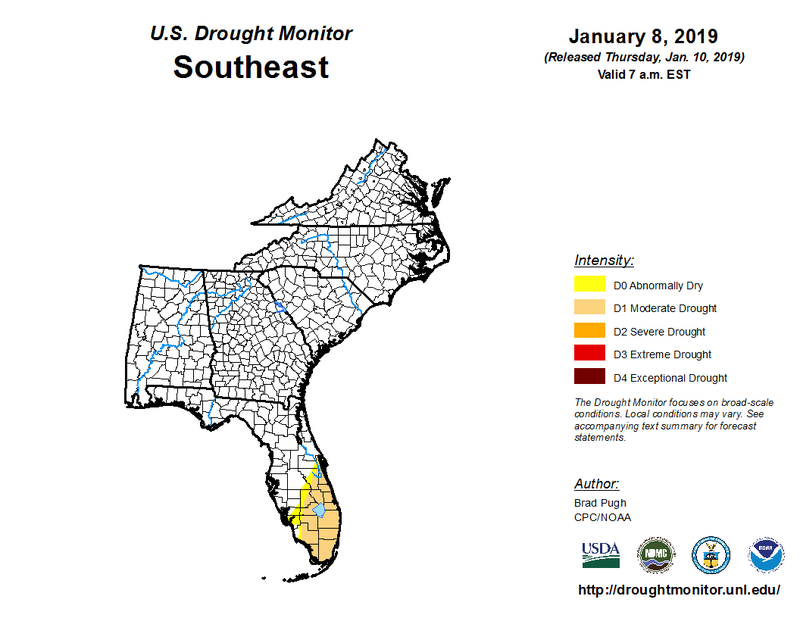 United States Drought Monitor, Southeast (Thurs. January 10, 2019). * Seventh District- Chicago– “Prices for corn, soybeans, and wheat moved higher over the reporting period, supported in part by news that trade talks between the U.S. and China had resumed and that China had purchased some U.S. soybeans. A second round of payments from the Federal Government’s Market Facilitation Program also supported farm incomes (primarily for soybean producers), although payments have been disrupted by the government shutdown. Gov’t pymnts in ’18 projected up 17.9% from ’17 at $13.6B—highest total since ’06. (prior to yesterday’s announcement). “The shutdown also slowed the release of government reports on agricultural market conditions, leading to greater uncertainty for market participants. Contacts noted that the profitability of the 2018 harvest was still unclear as a large amount of the harvest remained unsold. Lower ethanol prices weighed on ethanol producers, and there were reports of plant closures as well as expectations of more closures in the future. * Eighth District- St. Louis– “District agriculture conditions have improved slightly since the previous report. The percentage of winter wheat rated fair or better remained approximately unchanged from the end of October to the end of November and remains at 93 percent. This is an increase from 89 percent of winter wheat rated fair or better at the end of 2017. Contacts continued to report very high crop yields for 2018. However, farmers still face headwinds due to low crop prices and continued trade concerns. * Tenth District- Kansas City– “The Tenth District farm economy remained weak despite a slight improvement in prices of some agricultural commodities. In the crop sector, prices increased slightly from the prior period. Corn and wheat prices were slightly higher than year-ago levels, but soybean prices remained lower as uncertainty surrounding trade persisted. * Eleventh District- Dallas– “Ample soil moisture has boosted agricultural producers’ outlook for 2019, although prices for several crops remain low. The new farm bill offers farmers greater flexibility in choosing coverage options and reintroduced cotton as a covered commodity after it was removed in the 2014 farm bill. This cotton safety net is meaningful for many cotton growers as they secure financing for the upcoming crop season.